Difference between revisions of "1789"
Declaration of the Rights of Man and of the Citizen, handwritten copy from 1789. The Tennis Court Oath of 1789. 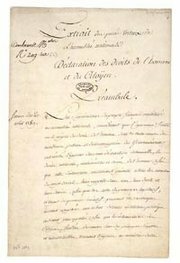 In 1789 Vincent Ogé makes a motion to the Assembly of Colonists in Paris. At the beginning of 1789, a year after it's founding in 1788, the Société des Amis des Noirs (French anti-slavery organization) has over 140 members. On June 20 deputies of the Third Estate swore the Tennis Court Oath at Versailles. This marks the start of the French Revolution. This revolution had an profound impact on the revolutionary events in Saint-Domingue, whose beginnings are usually dated to the meeting at Bois Caïman, the event that started the Boukman Rebellion in 1791. On August 26 the French National Constituent Assembly adopted the Declaration of the Rights of Man and of the Citizen. One of the leaders of the Saint-Domingue mulattos, Julien Raimond, and the French abolitionist and member of the Société des Amis des Noirs, Henri Grégoire meet. Wikipedia contributors (2006). Tennis Court Oath. Wikipedia, The Free Encyclopedia. Retrieved 14:41, May 5, 2006 . This page was last modified on 14 July 2006, at 06:38.